CHRIS Newton (Great Britain) achieved the best result of his career when he finished second overall in the Malaysian Tour of Langkawi, coming in only nine seconds down on winner Damian McDonald (Giant-Australian Institute of Sport). Newton collected a massive £10,000 for his second place, plus £1,500 for winning the climber's prize. He was never placed lower than second overall throughout the 10-day tour, which opened with Great Britain's victory in the team time trial. The overall contest was decided on stage four. It was only 62 kilometres long but 25 of them were uphill. The Genting Highland climb reared up from a height of 200 metres to the summit finish at 1600 metres. McDonald attacked in the last three kilometres and went into a race-winning lead after catching two early breakaways just 750 metres from the line. Newton made a brave defence of his yellow jersey after suffering a bad patch early on. He fought through it and finished impressively, moving up rapidly to finish fifth at the summit. Although he lost the leader's jersey, he only dropped to second overall, just 10 seconds down on McDonald. The Giant-AIS and Great Britain teams were content to ride defensively for the rest of the tour, which meant that most stages finished in high-speed bunch sprints. This was where Rob Hayles came to the fore. He showed great potential as a sprinter with a Cipollini-style stage win at Johor Bahru and a string of top five placings in the last five days. He finished tired but a good deal richer after a promising stage race debut. John Tanner was also getting up in the sprints after crashing and puncturing while wearing the yellow jersey on stage two. Ireland's Richie McCauley took a half stage but came in for some scathing criticism from other riders after refusing to work in the winning break. 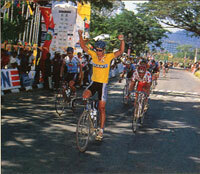 Newton started the final stage level on points for the mountains prize with McDonald. But good lead-out work by the GB team ensured he was first over the final climb to clinch the polka-dot jersey. `I'm tired but not wrecked,' Newton said at the finish. `I can't praise the lads in the team enough, they really worked their hearts out for me.' Newton, who nearly quit the sport after suffering for three months with a knee injury last season, was delighted with his first major success after achieving numerous near misses. The first-time promotion was organised at two months notice, with the assistance of British promoters Sports Ambassador. Visiting teams were impressed by the good roads, high-quality accommodation and a £250,000 prize list. The GB squad of Chris Newton, Bryan Steel, Matt Illingworth, John Tanner, Simon Lillistone and Rob Hayles made a brilliant start to the 10-day Tour, winning the opening team time trial. Giant-AIS, the Australian national team were hot favourites, but blew apart after strongman Paul Brosnan punctured with 10 kilometres to go. Britain's sextet, based on the national team pursuit squad plus roadman Tanner, clocked 46-04 for the 39.5-kilometre test to beat Giant by 41 seconds. Tanner, the first GB rider across the line, took the yellow jersey, which meant a bonus of £500 on top of the £2,500 stage prize. The 23 six-man teams from 17 nations were then ferried from Langkawi Island to the mainland for the first road stage from Kangar to Georgetown. With 15 kilometres to go a bunch sprint was looking inevitable. Britain, holding the first six places overall, were sitting pretty. Their troubles started when Lillistone suffered a broken spoke and was dropped just as the speed was hotting up. The field roared across the 15kilometre-long Penang Bridge and was just coming on to an access road when an Australian hit the centre barrier, bringing down five others, including yellow jersey Tanner. He quickly remounted but needed service for a front wheel puncture. Hayles and Illingworth dropped back for him and set off in pursuit of the bunch. `Rob and Matt really drove me along, but then I punctured again, a back tyre, on a drain joint,' said Tanner. After another change he dropped his team-mates, closing to within 1-20 of the bunch. New Zealander Glen Mitchell won the 100-man sprint, while Steel took over the yellow jersey with Newton second. `I've never been in this position before in a big race and I know I won't hold on to it, but I'm just going to enjoy the experience,' said trackman Steel. Sunday's third stage was a high-speed affair on wide, well-surfaced main roads. Breakaways were impossible and all the British riders were safely in the bunch for the massed sprint. 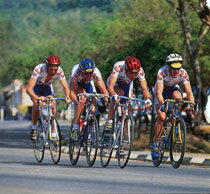 Newton crossed the line just ahead of Steel and duly took the leader's jersey - and a third £500 bonus for the team. With a week to go, Newton had no pretensions of overall victory. However, Tanner would have been a realistic contender had he not crashed. But with the mountains still to come, the British number one still had a chance to get back into the reckoning.